Please take note that the usage of this mode is at own risk. It is a fully open configureable mode and we won't do any checks on our software to prevent from wrong configurations! We will give a description about the differences to the nitro and electric mode here. Before using this mode read and understand the warnings and hints on the other 2 modes carefully. 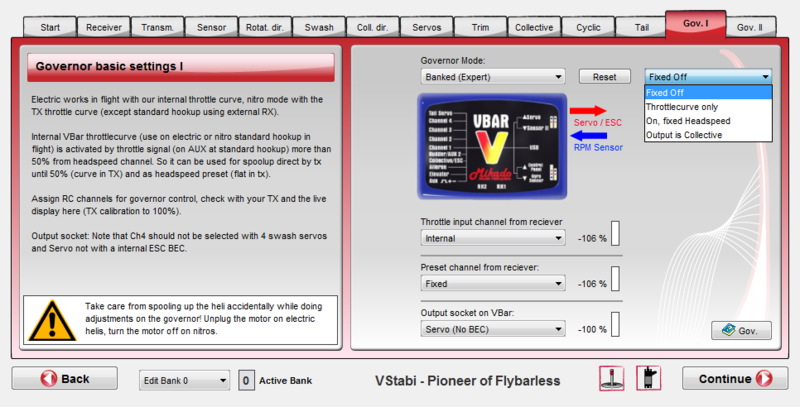 After activating the Expert mode click on the reset button to set our default values (nitro paramters will be used) to the VBar. This mode has to be set each bank seperately while using bank switching. Fixed off: Throttle output signal fixed to -100 % for motor off. Throttlecurve only: Governor disabled. Output to the assigned socket by internal or tx throttle curve as selected. On, fixed headspeed: Governor eanbled, headspeed from preset channel or fixed to max value depending on preset channel settings. Output is collective: Governor off, collective TX input will be given as straight output to the assigned servo socket. Selecting a channel it will be the same as on nitro mode. Selecting internal we use the internal throttle curve which can be set in flight panel. Selecting a channel it will be the same as on nitro mode. Selecting "Fixed" the target headspeed will be set to the Max. RPM value (like 100% preset input) for this bank. The same as nitro/electric. Take note about the BEC limitations for electric helis at servo output. No output is also availalble. This will be the same as on nitro mode. Max. Headspeed: The same as on nitro mode. If mode is set to "On, fixed headspeed" this value is the target headspeed without using a preset channel. Gear Ratio: The same as on nitro mode. Sensor configuration: The same as on electric mode.